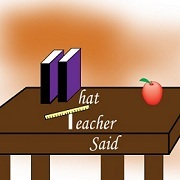 What Teacher Said: Office Politics Issue: Please Help Me! Office Politics Issue: Please Help Me! So my question of the day is this: Is there anyone out there who can actually navigate through the turbulence of daily office political maneuvering and come out at the end of the day without having had to resort to using a barf bag, crying copious snot-producing tears, devouring a 2 pound sack of Hershey’s, drinking an entire bottle of Bacardi sans Coke Zero (because you’re out), or dramatically quitting the stupid job in a huff. Note that these options are not exclusive; I have personally used several of these tension-reducing strategies simultaneously after a particularly bad day. One piece of good advice that I routinely ignore is to stop checking my office email at 5PM, so I can legitimately put off until tomorrow whatever it is that I’m not going to want to deal with and therefore have a good night’s sleep. Current time here in Georgia: 2:36 AM. Status: Wide awake, worried, angry, hurt, and slightly nauseated from the number of Hershey’s Special Dark “Fun” bars I have consumed. Let me just say that the empty wrappers cover a radius of 2 feet around my desk chair, which can be considered the center of the circle. If you’re an ambitious sort, feel free to calculate the area of the circle covered by chocolate foil. But I digress. It’s 2:47AM now and I want to figure out a workable strategy or two for dealing with the issue my close colleague brought to my attention at 9:05 PM. It seems that I said something on Thursday (we had a long holiday and today is Tuesday) which offended him so deeply that he no longer wishes to work with me. A simple “I’m sorry” will not mend this, an excuse such as “I was having a bad day” will not mend this, and, quite frankly, I am coming to the conclusion that I cannot fix my mistake this time. That said, it’s 3:17 AM and I’m beginning to wonder if I’m concentrating on the wrong thing. Perhaps what I should really be considering is not HOW to fix the problem; it’s whether or not I really WANT to fix it at all. Is it worth the time and the emotionally exhausting measures that I have had to resort to in the past when dealing with this colleague? I am weary of measuring my every word in order to avoid giving offense and then finding out that I have still chosen the wrong ones anyway. It is possible for me to arrange my schedule so that I no longer work directly with my affronted colleague. Of course, I will have to notify my boss of the change in schedule. Maybe she’ll be a peach and not ask too many questions. How likely is that? Yeah, that’s what I think, too. My brain begins to churn out things I can tell her that won’t make me look imbecilic. 3:29 AM Sure wish I could pull a Scarlett O’Hara, tell myself that “tomorrow is another day,” and just go the heck to sleep. I’m pretty sure this won’t be the last time I offend a colleague, so tried and true strategies that you have used for dealing with these situations would be extremely helpful. I’ll start a list and post them on the fridge. Please. Help. Me. 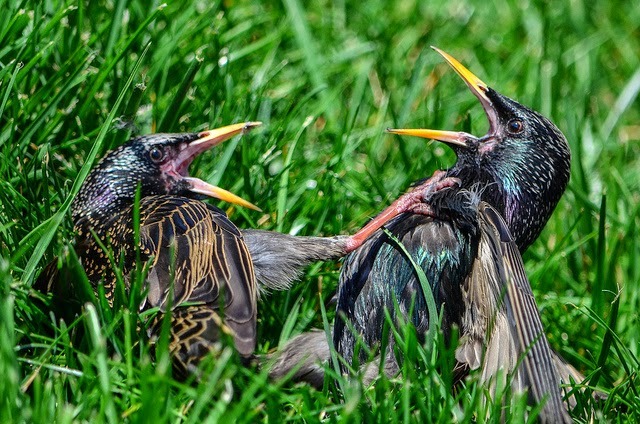 Creative Commons Photo "Starling Fight Club" by Angela N.